Is it a sweet or savory that brings you back to your childhood supper table? Who was there? What details make your memory extra special? Generous Japanese friends have taught me their secrets to tamagoyaki making. I am grateful. So is my husband. But with Iron Chef Morimoto’s tamagoyaki making technique – from his newest cookbook, Japanese Home Cooking – I’m super excited to report a replication of sushi restaurant style Japanese egg omelet. Of course, tamagoyaki atop Japanese white sticky rice is scrumptious. But as summer weather approaches, I want to leave more room for ice cream! My strategy is to amp up the salad greens so I can have that extra scoop of dessert. #sorrynotsorry I am a kid at heart. Speaking of children, tamagoyaki is very kid-friendly. (My niece and great-nephew will vouch for this fact.) 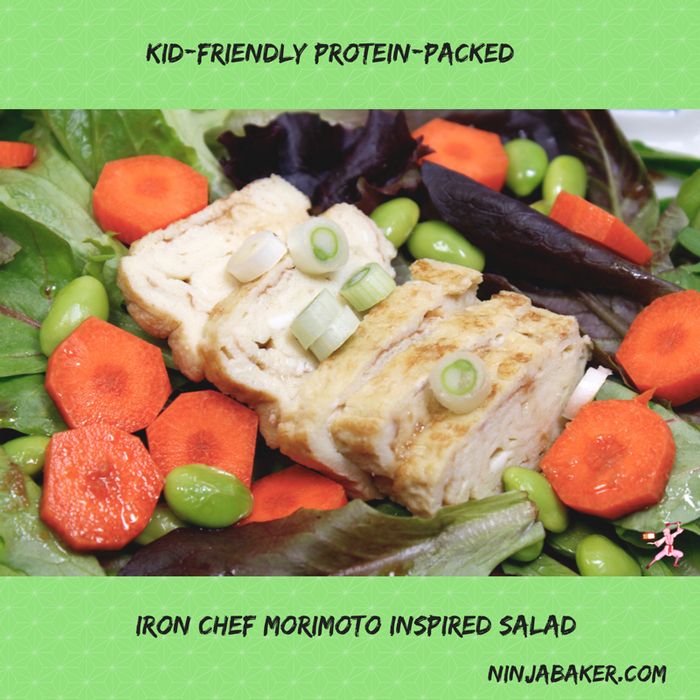 My Iron Chef Morimoto inspired salad is guaranteed to provide healthy edible options for kidlets. 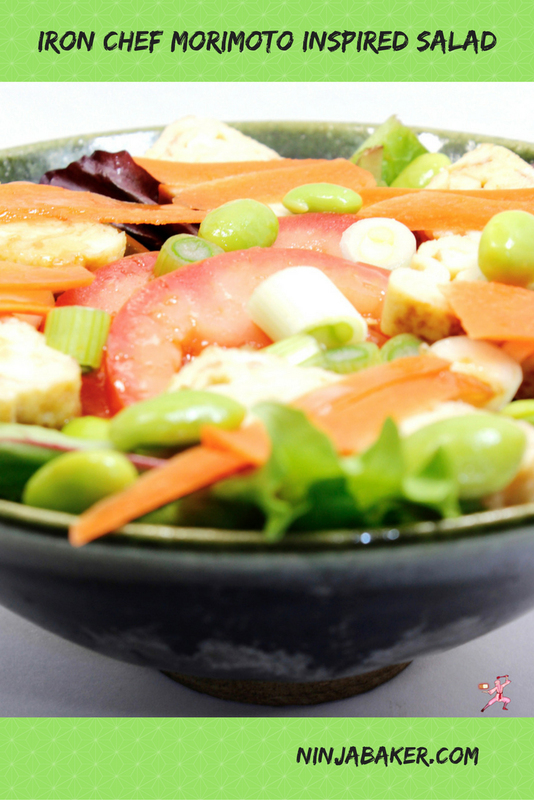 In addition to the Japanese egg omelet, the salad is sprinkled with edamame soybeans. Fresh ginger which is the star of the salad is dressing is also good for you. (Ginger is known to fight cancer, inflammation and memory loss!) What are your strategies for making sure family meals are yummy and healthy? Love to hear! Also, please do scroll down. You’ll see fantastic ways to make your great Sunday Supper repertoire even better. 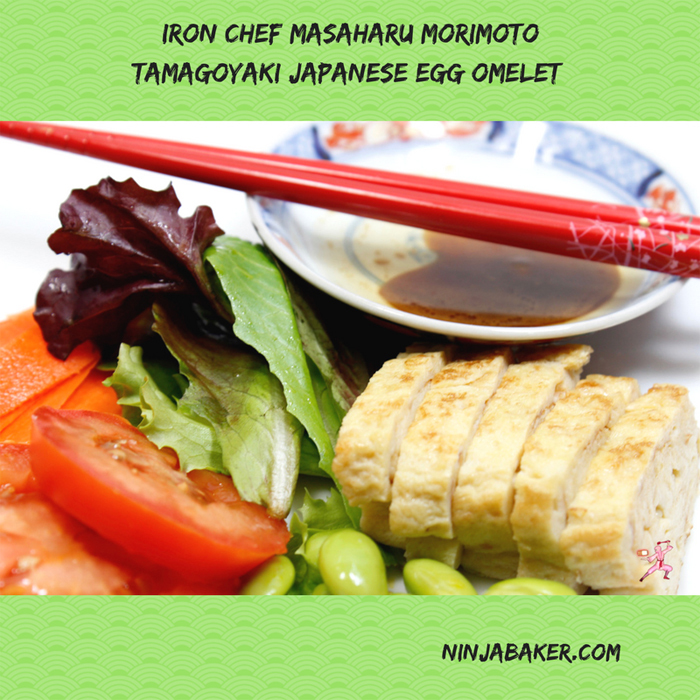 Thank you to Iron Chef Morimoto for his fantabulous Japanese egg omelet tamagoyaki recipe. 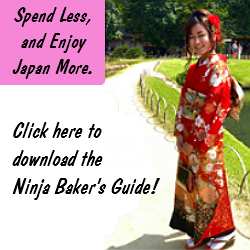 (His Japanese Home Cooking Cookbook is a must!) I’ve been making tamagoyaki for years. However this is the closest I’ve come to actual sushi style Japanese egg omelet. Not too sweet, not too overcooked but just right! Domo arigato Iron Chef Morimoto. 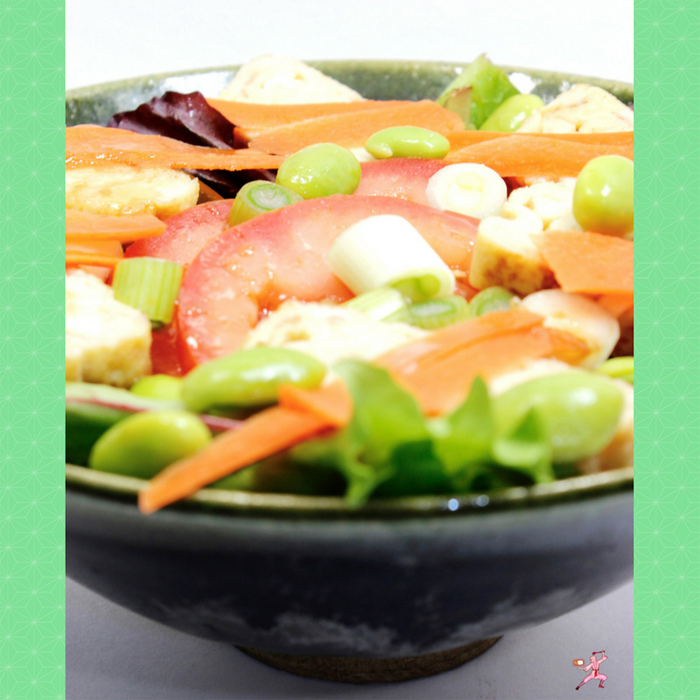 This Iron Chef Morimoto inspired salad is healthy. It’s packed with protein AND deliciousness. There’s a bit of sweet in the egg that is balanced with the sterner edamame. Soft lettuce leaves dressed with rich sesame oil is accented with sharp ginger. Last and not least, the salad is light so you can eat dessert guilt-free! Drop the kombu (dried kelp) into a saucepan with the water. Watch for little bubbles to emerge and break through the surface. Remove from the heat. Remove the kombu. Gently stir in the bonito flakes. Steep for 3 minutes. (A minute more and you’re heading for bitter soup stock.) Strain through a colander double lined with paper towel into a bowl. Lightly press the flakes. Discard the bonito flakes in the paper towel. Set aside the soup. Whisk together the eggs, dashi, soy sauce and sugar. Lightly, ever so lightly, brush the pan with vegetable oil. Coat the pan with a thin film of the egg mixture. The heat should be medium-low. Gently punch any bubbles with chopsticks or a light spatula. It helps to keep nudging the sides in too. Turn off the heat when the egg film is firm. 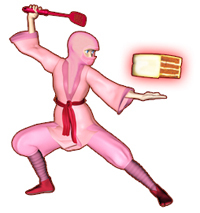 Roll up with a spatula or chopsticks. Grease the empty side of the pan. Pour in a few more tablespoons of the egg mixture over a medium-low flame. Tilt the pan so the runny egg slips under the already formed roll. Arrange the salad condiments on dishes or in bowls. Whisk together the above ingredients. Sprinkle on salad. Our sumptuous display of Sunday Supper salad offerings is hosted by the lovely Em Beitel of Our Life Tastes Good.